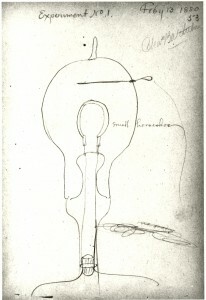 This is an early sketch from Thomas Edison of his light bulb. Edison then resorted to a carbon-based, high-resistance, filament. 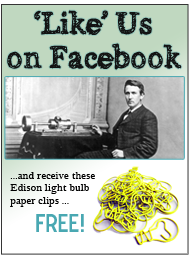 One year later in October 1879 Edison successfully tested a filament that burned for 13.5 hours. Continuing to improve his design, by November 1879, he filed for a U.S. patent for an electric lamp using “a carbon filament or strip coiled and connected … to platina contact wires”. The filament was made from a piece of carbonized thread. From coneption to invention, this is one of Thomas Edison's early light bulbs. Throughout his career, Edison worked on many improvements to his signature invention, an invention that literally changed the way we live after dark. Prior to the light bulb, folks burned lamp oils or used manufactured natural gas for illumination, a rather dangerous way to provide illumination. Electric lights became cheap, safe, and convenient to use and the public and commercial concerns installed them in rapidly increasing numbers. The rest is history. 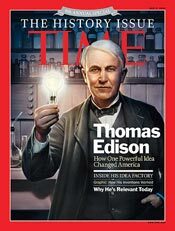 Is it true that Edison made up to 1,000 attempts/efforts before he finally succeeded on Bulb invention? Please clarify this. I am a Mechanical Engineering student and this was more than enl8ghtening.. I had guessed he had success with tungsten. I had no idea it was carbonized bamboo that provided him with his success in the longevity of his buld. Good read! As usual the historical truth concerning the light bulb and Edison is incomplete. Lewis H. Latimer was an African American draftsman and inventor who worked for Maxim,Edison’s rival. However no one mentions his patents for the light bulb or the 1st viable light bulbs and improvements to an industry he helped create. Keep in mind the racism of the day & the eugenics movement. Both of which most likely help conceal the historical truth. Hope you are a bit more enlightened. for both her comfort and mine. If you may need more information regarding online pet store Singapore, visit pet boarding. other dogs they think are obtaining the attention they deserve. And it didn’t give much info. And this is for a school project Very disappointing guys! This does not give the information i need about contributions Thomas Edison making industrialization with with his light bulb. can u plz include more info abt how Thomas Edison made the light bulb. Edison did NOT invent the light bulb. Period. It is a well known fact to historians that several dozen inventors were using inferior light bulbs trying to make them commercially viable. They were easy to break and also gave off a dim light. One of these inventors Carl Munck a German immigrant had used several filaments and one was a carbonized bamboo. Edison didn’t really “steal” this idea but rather “borrowed” it from a worker. With this Edison made the first bulb that would last a few weeks and not burn or break. Tesla also had ideas “removed” from him when he worked for Edison. Tesla was far more a pioneer than Thomas Edison. Thomas is a good inventer! i agree and i have to do a report about thomas edition and there is so much to learn!!!!!!!! South Foreland lighthouse at Dover, England, had been using a carbon arc electric light bulb since 1859, twenty years before Edison ‘invented’ it! 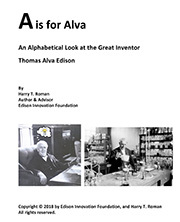 I am doing a report on Thomas Edison and other people might have came up with the idea but Thomas was the one that made it happen!!! It’s a very informative topic. The history behind the discovery of bulb was unknown. Now have came to know about it. So, thank you for this article. Is there any other facts that anyone might know about Thomas Edison as I need them for a project for school. We need more information regarding the invention of electric bulbs. Can you tell us more about how and who invented the lightbulb and there go deeper with how he changed it. tell about where he design the patented light bulb. Can you tell exactly when it was made and when he started. 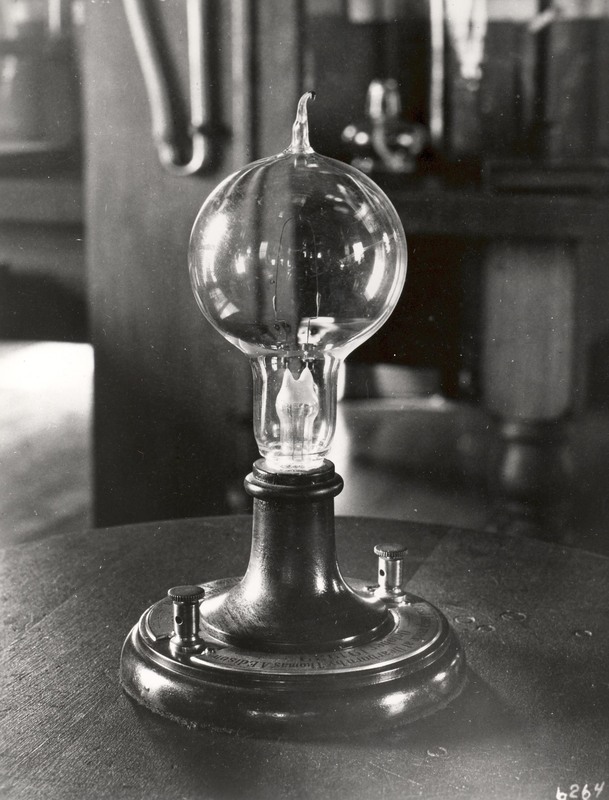 The first electric light globe and how light globes changed since their invention?? How does this invention of Edison help the man and the world nowadays? When I visited the Edison winter home in Ft. Myers, FL in 1975 the bamboo filament light bulbs he installed there in what I think was the turn of the century were still burning. He took out a new patent every time he updated to a new and better filament material. 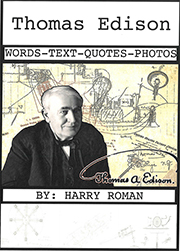 Edison held over 1,000 patents. Can I please have the name of the author who wrote this? I need it to cite this page. Just amazing. May I please have the name of the author? I need it to cite it. Craigside House in England, bulit by industrialist William Armstrong, was the firs house lit by electricity in 1878. He installed a Seimens water genrator in a nearby creek and lit the house with arc lamps. (UV is not good for the eyes, though.) Electricity replaced his 1863 hyrdraulic power. There were hydraulic washinmg machines, rotiseries, and an elevator between floors. The arc lamps were replaced in 1880 by incandescent bulbs. Other notable Edison inventions are the motion picture camera (movies) and the phonograph (voice recorder).